For many moms, especially those with fussy babies, the rocker or the glider is your ultimate best friend and only source of comfort on those lonely hours between twelve midnight and five in the morning. The repetitive motion is not only soothing to a baby but also to the sleep-deprived mother. Naturally, it is a wise move to choose a rocker or glider that will make both of you very happy on those lonely hours when it’s just the two of you. This is where the Little Castle Gliders come in. These lovely chairs come in different colors and plush fabrics that are guaranteed to keep you comfy as you lull your little one to sleep. The Little Castle Gliders have high backs and armrests, all cushy and comfy, to support your arms on those long nights and keep numbness and fatigue at bay. Little Castle Gliders also glide smoothly along the set track and even provides a smooth 360-degree swivel if your baby prefers those motions to the gliding..
Little Castle Gliders are also guaranteed safe for you and your little one and will not fall apart so easily. In fact, it can last for years beyond the toddlerhood. Since Little Castle Gliders are also so comfy and look more or less like a furniture piece suitable for any room in the house, you can also move it to any room of your choice if you wish to move it from the nursery. Now, that’s one chair that outlasts its price. Little Castle is a name you might be familiar with if you’ve been looking for nursery furniture. They have been in business since 1999 and have been manufacturing nursery gliders. What are these gliders for? These are actually used by parents when they want to rock their child to sleep. The chairs rock gracefully and the upholstery helps keep the parent and child comfortable during the lulling period. Unknown to some, Little Castle gliders are actually hand made by carpenters employed by the company in the United States. That is why the crafting of these chairs is so professional that you wouldn’t mind using them outside the nursery when your children grow up. You can also contribute to the construction process should you wish to. You can suggest the fabric to be used and even provide your own. Little Castle gliders come in various forms. There are those that have reversible cushions, detachable pillow backs and even some that swivel and recline. Additionally, much research and consolidation of construction techniques has been put into the development of these chairs. That’s the reason the chairs all offer superior comfort. You will never go wrong with purchasing Little Castle gliders. Flexibility, quality and comfort are all offered along with competitive pricing to stop you from thinking twice about their products. With prices ranging from $600- $1000, you can enjoy one of these world renowned gliders. 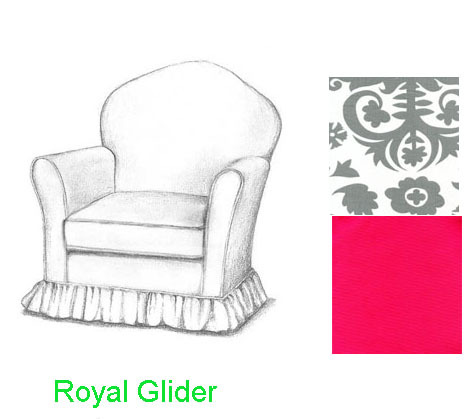 Custom nursery gliders are a great option! How would you like it if you can get a nursery glider that looks exactly as if it belongs to your nursery alone? That’s what customizing can do for you. Custom nursery gliders offer not only a place wherein you can cuddle your baby while nursing or soothing him or her to sleep, but also provide you with seating that’s sure to afford you optimum comfort, support and design that’s perfectly matched with your nursery decor. Because these gliders are custom-made according to your specifications, you are free to select among a wide range of glider fabric types, colors, and patterns that will be the right fit for your nursery’s color palette and theme. What’s more, opting for custom-made gliders will also offer you choices when it comes to contrast piping fabrics, skirting designs, arm covers, and even nursing pillows. Aside from giving you fashionable options when it comes to the looks, feel, and aesthetic appeal of your nursery gliders, many custom-designed gliders also offer better comfort through designs with wider seats or higher seatbacks. Getting wide-seat custom gliders is perfect for you if you want extra room for shifting into a variety of seating positions from time to time, so you and your baby are kept comfortable even during extended periods of sitting. There are also custom nursery gliders with 360-degree swivel and adjustable recline mechanisms for your added comfort and convenience. With these custom gliders coming in designs, colors, textures and fabric patterns of a wide selection, you are set to relax and glide in style and cushioned comfort. Little Castle’s upholstered gliders and recliners stand out because of custom fabric options, which let the customer “Design the Difference!” Every Little Castle chair is fully customizable, from the skirt to the piping, using any combination of over 120 Little Castle or House, Inc. fabrics, or even fabrics you supply! In this way, Little Castle ensures that your chair will be loved by you and your family for years to come. By far the best-selling Little Castle model is the Cottage Glider. The Cottage Glider is a bit smaller than others in the line, making it great for smaller rooms and nurseries, but still boasts a nice deep seat (33”D) making it plenty roomy for even the tallest parents. This glider offers a loose cushion seat and an attached pillow back which is channeled to keep its shape and comfort over the years. The Cottage Glider has gently outwardly curving Pendleton arms, and the choice of either a tailored or ruffled skirt. Options include arm covers, throw, nursing, or lumbar pillows, and contrast piping. Little Castle also offers ottomans to match, and here too you have choices! You can choose a hassock, a stationary ottoman, a gliding ottoman, or an ottoman with glide and swivel! The ottoman skirt and fabrics can be chose to match your chair as well. The Cottage Glider also offers one more option – a recliner! The Cottage Glider Recliner is slightly larger than the Cottage Glider, and instead of a skirt option has a fitted bottom edge with a built-in footrest. The recliner arm is hidden inside the chair for a stylish look! Despite the recliner’s footrest, many people still choose to accessorize with an ottoman or hassock for maximum versatility. 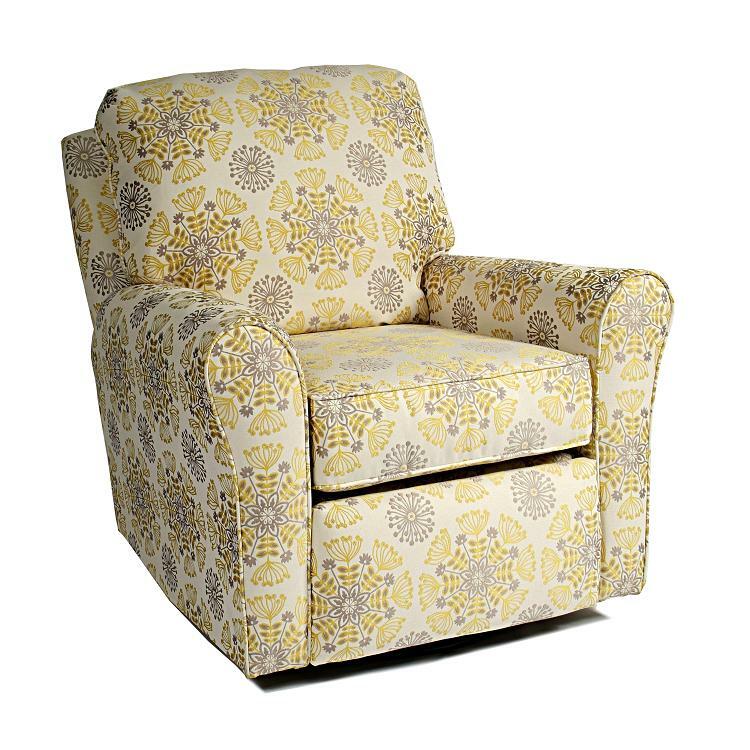 Either the Cottage Glider or the Cottage Glider Recliner is a wonderful choice for years of comfort in a baby’s room or in any room of your home! Free fabric swatches for Little Castle Gliders as well as consultations to help customize your glider without confusion are available through RoyalBambino.com! All of Little Castle’s swivel gliders are Made in the USA and meet California fire retardant standards. Little Castle gliders are made with quality components, including 9 gauge no-sag springs placed closely for comfort, chair cushions with a durable 1.8 density foam core wrapped entirely with polyester to soften seating, pillow backs filled with 100% hollow polyester fiber made in the USA, and an all steal tubular ring base for greater stability in any position. Little Castle Gliders are available exclusively at fine children’s retailers across the USA.